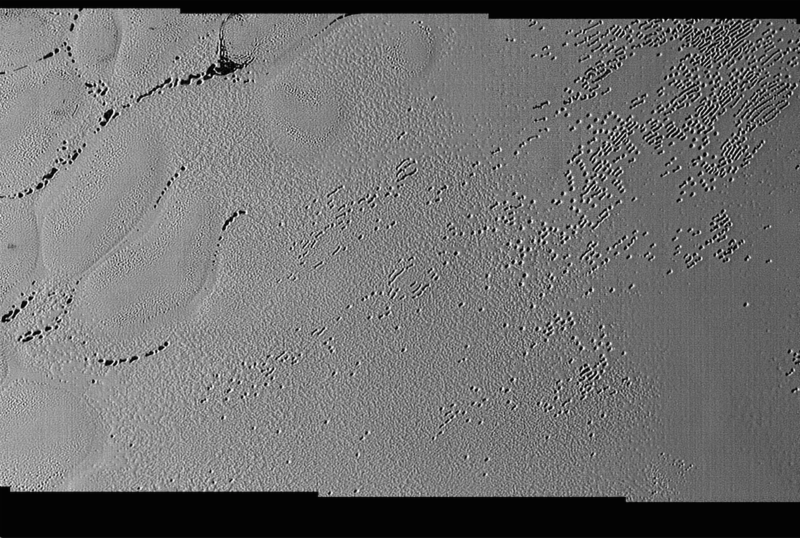 NASA's New Horizons mission has returned an intriguing photo of Pluto's Sputnik Planum plains, showing an "enigmatic cellular pattern" and "unusual clusters of small pits and troughs". Scientists speculate the pits and troughs may be formed by the sublimation or evaporation of nitrogen ice. New Horizons project scientist Hal Weaver said: "Pluto is weird, in a good way. * The pits, and the way they’re aligned, provide clues about the ice flow and the exchange of volatiles between the surface and atmosphere, and the science team is working hard to understand what physical processes are at play here." The image was snapped by New Horizons' Long Range Reconnaissance Imager (LORRI). It represents an area of around 210km across at a resolution of roughly 250 metres. The Sputnik Planum, seen above in a wide view, is largely featureless from a distance, and the absence of impact craters is evidence of the area's geographical youth, NASA notes. *We shudder to think what the potential implications for humanity might be were Pluto weird in a bad way.